HOBOKEN, N.J. (March 21, 2011) – Former WBO and The Ring light flyweight champion Ivan “Iron Boy” Calderon will be seeking revenge April 2 against the only man to defeat him, current 108-pound king Giovani “El Guerrero Azteca” Segura, in their highly-anticipated rematch headlining the “La Revancha” Pay-Per-View event, live from Auditorio del Estado in Mexicali, Mexico. “La Revancha: Segura-Calderon 2,” presented by Zanfer Promotions and PR Best Boxing, will be distributed in the United States by Integrated Sports Media for live viewing at 9 PM/ET – 6 PM/PT on both cable and satellite pay-per-view via iN Demand, DIRECTV, DISH Network and Avail-TVN, for a suggested retail price of only $39.95. 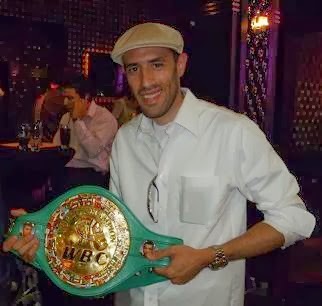 Prior to fighting Segura, Calderon appeared to be invincible having ruled the 108-pound division as WBO light flyweight champion for more than three years (six successful title defences), as well as the 105-pound WBO minimum-weight division (11 successful title defences) from 2003 until he moved up in weight in 2007. Ivan is currently rated No. 1 by The Ring and No. 3 by the WBO. He had taken on and defeated the best light flyweight and minimum-weight world champions and challengers, including Rodel Mayol, Reyes, Higo Fidel Cazares (twice), Nelson Dieppa, Issac Bustos, Roberto Carlos Leyva, Ednar Cardenas, Alex Sanchez and Eduardo Ray Marquez. “Everything has been real good and I’m already at 110 pounds,” Calderon said from his Puerto Rico-based training camp. “I’m working hard in training to make sure that I do better than I did in the first fight against Segura. My fans will be in Mexico with me in spirit. I know a lot of people will be booing me there, but I know how to control that and remain focused in the ring. The 28-year-old Segura (26-1-1, 22 KOs), fighting out of Bell, California by way of Mexico, captured the WBO, The Ring and WBA Super light flyweight titles last October, when he knocked-out the previously unbeaten champion Calderon (34-1-1, 6 KOs) in the eighth round in Puerto Rico. Segura was leading (69-64, 68-65, 67-66) on all three judges’ scorecards at the time of the stoppage. “I didn’t train right for our first fight,” Calderon added. “My leg muscles were injured. I couldn’t run and training days were suspended in the gym. I usually spar 100 rounds but all I had was 45 for the last fight. No excuses, he did the job, but that wasn’t the Ivan everybody knows. I need to be able to move my legs to control the fight. I couldn’t move because of my legs and he worked my body good. I had to go toe-to-toe with him. He controlled the fight. “He’s not a good technical fighter, but he’s strong and keeps pressure on his opponent. He did hurt me with body shots. He’s not a real 105-pound fighter; he’s a natural 112-115 pounder. He was real hungry to knock me out and he did the job. The co-feature matches Mexican featherweight champion and three-time world title challenger, Ricardo “Piola” Castillo (39-9-2, 26 KOs), against former WBC Continental Americas super featherweight titlist Joksan “El Torito” Hernandez (21-3, 14 KOs) in a 10-round bout. Castillo is the younger brother of 2-time world lightweight champion Jose Luis Castillo. All fights and fighters are subject to change. For more information about the Segura-Calderon 2 PPV event go to www.integratedsportsnet.com. Follow Integrated Sports Media on Twitter @IntegratedPPV.